About 20 years ago, two very important things happened that changed the footballing landscape forever. The back-pass rule was introduced and Peter Schmeichel joined Man Utd. The rule-change introduced us to the panicky hoof into the stand and ‘keeper Cruyff-turns, while the Dane’s long throws were a huge novelty. Barely seen before, these events are now part of the footballing furniture. Inspired by this from @ChrisJLilley, Differentgame took a look at the numbers provided by the MCFC Analytics project to see how goalkeepers’ distribution effected their sides. 5 of the top 6 clubs in the EPL had the ‘keepers who did this the least. The only exception was Newcastle’s Tim Krul. The only other 3 ‘keepers who launched it as much as Krul were Adam Bogdan, Paul Robinson and Wayne Hennessey. They all ended up getting relegated. So what made Krul different to Bogdan, Robinson and Hennessey? Not a lot. They were all responsible for around 50% of their teams’ long balls. Krul’s accuracy was on par with Bogdan and worse than Hennessey’s. Robinson was least accurate. But this “accuracy” very much depends on the no of attackers v defenders, their ability and their willingness to fight for the ball. But Newcastle’s forwards won less aerial duels than their Bolton and Wolves counterparts. Obviously, launching it is going to lead to the ball going loose more often as challenges are made and the ball is less likely to go where it’s intended. Newcastle where 4th best in the league at “recoveries” (winning the ball back when it goes loose). Blackburn and Wolves were 18th and 19th respectively. Newcastle then were content to have Krul get the ball to the final third confident they’d win the second ball. They still weren’t creative, though, as they were 16th in the chances created column and 14th in the big chances (one-on-ones or close range chances) column. Demba Ba was managing to net despite getting into less big chance positions than fellow top scorers in the league. In short, Newcastle appear to have got lucky. In most respects they look like a mid-table side. Chelsea were happy to have Petr Cech go long too. He hit 60% of all Chelsea’s long balls last season. Still, when you’re as good as Newcastle at recoveries, your outfield players play less long balls than any other team AND you have the player who creates the most chances in the league in Juan Mata, you’re not lucky, you’re finishing where you probably should. The longest long ball teams (apart from Wolves) were Stoke, Norwich and Everton. Instead of contributing to the team long ball ethos in a big way like Krul, Bogdan, Robinson and Hennessey did, the ‘keepers from these teams did the opposite. They contributed the least amount of long balls as a % of their teams total. 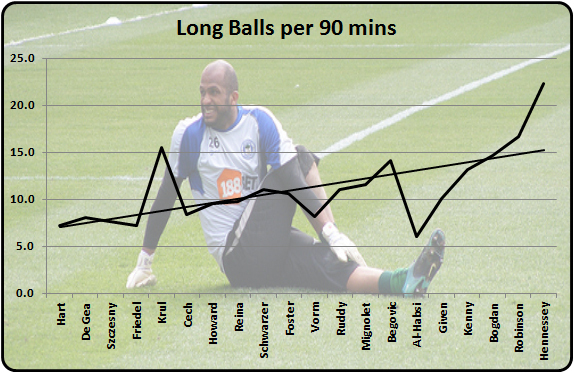 Tim Howard contributed the least in this regard accounting for just 28% of all Everton’s long balls. Everton finished the highest of all the truly long ball teams. Stoke and Norwich finished comfortably mid-table. The prolifically brilliant @MarkTaylor0 studied the advanced MCFC Analytics data set from the Bolton v Man City game last season looking at how passing sequences create chances. He was kind enough to send Differentgame the passing sequences started by the goalkeepers in that game. 33 passing sequences started with Jaaskelainen. Just under 60% were long balls. Only 2 of the 33 sequences ended with more than 1 outfield Bolton player touching the ball. Neither move lasted more than 3 outfield touches. Bolton were one of the most adept teams at winning aerial duels last season – especially with Kevin Davies up front as he was that day. Bolton created just 4 chances in the game (none starting from a kick by Jaaskelainen) yet managed to score twice. Granted this is just one game, and against the eventual champions at that, but it illustrates the kind of luck needed to be successful by having your ‘keeper lump it for a full season when you don’t possess the likes of Mata in your squad. This entry was posted in Sports and tagged Ba, back pass rule, Bogdan, Bolton, Chelsea, Davies, Everton, goalkeepers, Hennessey, Howard, Jaaskelainen, Krul, Long ball, Mata, mcfc analytics, Newcastle, Norwich, Opta, Robinson, Schmeichel, Stoke, Wolves. Bookmark the permalink. Really good article. One little comment – goalkeepers for struggling teams are likely to touch the ball more often than those for better teams, so will have more passes overall, both long and short. Have you thought about using proportion of passes which are long rather than simply the number of long passes. I imagine the trend will be largely similar, but interesting nonetheless.